The total payouts to whistle-blowers in the federal government’s $16.65 billion settlement with Bank of America over its mortgage business may approach $170 million. Edward O’Donnell, a former executive at Countrywide Financial, and Robert Madsen, a former property appraiser for the bank already have been identified as two of the whistle-blowers that federal prosecutors gave credit to in the settlement agreement with Bank of America. 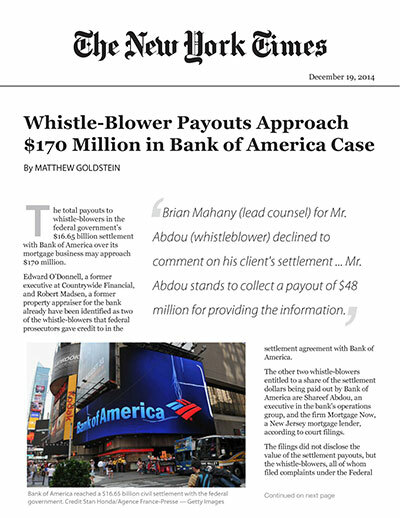 The other two whistle-blowers entitled to a share of the settlement dollars being paid out by Bank of America are Shareef Abdou, an executive in the bank’s operations group, and the firm Mortgage Now, a New Jersey mortgage lender, according to court filings. The filings did not disclose the value of the settlement payouts, but the whistle-blowers, all of whom filed complaints under the Federal False Claims Act, are collecting payments equal to 16 percent to 17 percent of specific portions of the $16.65 billion, according to court filings and people briefed on the matter but not authorized to speak publicly. Using that formula, Mr. Abdou stands to collect a payout of $48 million for providing information to federal prosecutors. Brian Mahany, a lawyer for Mr. Abdou, declined to comment on his client’s settlement with the government. He said his client was currently on leave from his position with Bank of America. Clifford Marshall, a lawyer for Mortgage Now who also worked with lawyers from Milberg, said his client would receive $8.5 million, based on a 17 percent share of the settlement amount. The payout to Mr. Abdou is slightly less than the $57.6 million being paid to Mr. O’Donnell and the $56 million that Mr. Madsen said he would receive. In the payout calculation, the portions of the settlement that prosecutors gave Mr. Abdou and Mortgage Now credit for are smaller than the ones assigned to Mr. O’Donnell and Mr. Madsen. The settlements with the whistle-blowers are referenced in the $16.65 billion civil settlement agreement between the Justice Department and Bank of America but the names were withheld, although Mortgage Now’s name inadvertently appeared in one of the settlement papers. The combined $169 million in whistle-blower payouts would make it one of the larger settlements the federal government has agreed to in any single case. Each of the four whistle-blowers had brought a “qui tam” action under the federal False Claims Act. The whistle-blowers then began working with federal and state authorities, who were investigating allegations that Bank of America, and companies it acquired like Countrywide, had churned out billions of dollars of shoddy mortgages and related securities in the run-up to the financial crisis. A qui tam action is intended to help protect jobs of potential whistle-blowers who assert that they have claims of fraud against the federal government. The complaints filed by the four whistle-blowers were recently unsealed by federal judges in the wake of the bank’s settlement. A bank spokesman has said the matter is resolved and the bank will not comment further.